This dairy free coffee creamer is rich and sweet. It’s free from refined sugars or sweeteners it’s the only dairy free coffee creamer you will ever need! Vegan and Paleo approved. I love it when my hubby returns from a business trip. Especially the fact that he normally comes bearing gifts I just miss him so much when he’s away. It must be the whole absence makes the heart grow fonder thing. This time he returned with some goodies from Nespresso. 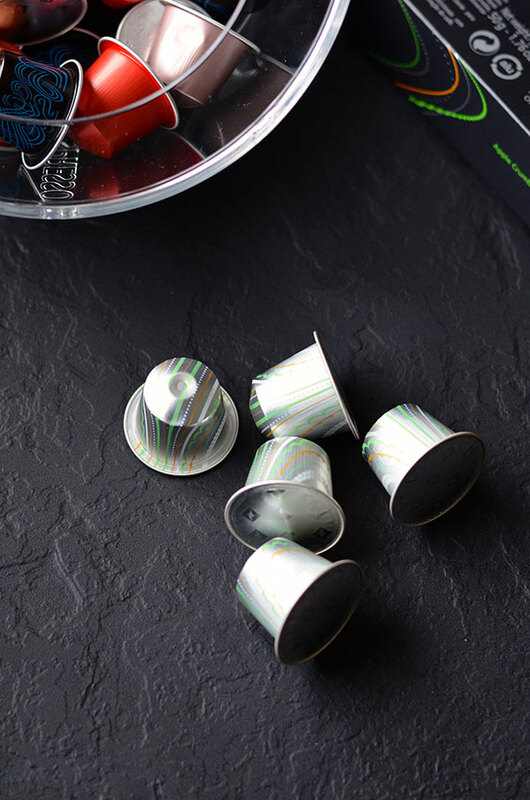 A sleeve of one of the limited edition Nespresso variations capsules. There are three new tempting flavours. Chocolate Mint ,Hazelnut Dessert and Apple Crumble . Apple crumble was the winning temptation. Now, if I never mention anything about my husband in another post the one thing you should know about him is he loves his coffee. 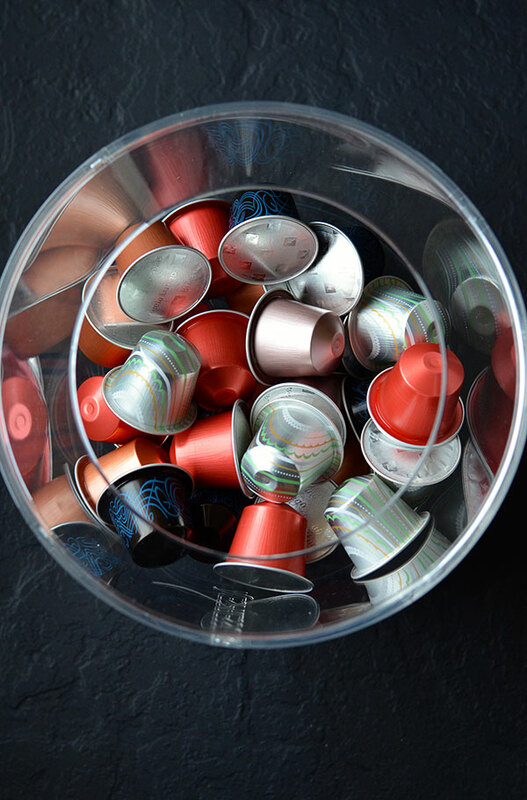 Espresso, the real deal, not that instant stuff. He loves it and he drinks copious amounts of it. I am not a huge coffee drinker, I much prefer tea but Apple Crumble Espresso? I was really curious. Whenever I do drink coffee I tend to add lots of milk. On this given day I did not have any nut milk on hand but I was so desperate to try this coffee I had to come up with something. 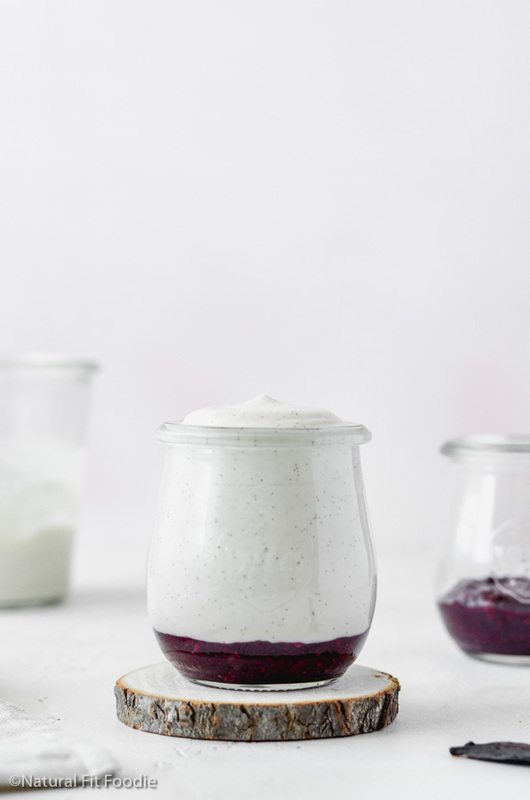 Here’s how I did it: I had some dates soaking to make this gorgeous dessert so I threw a few of those in the blender together with some Organic macadamia nuts , a pinch of salt and a dash of homemade vanilla extract. With just enough water to cover everything I whirled it away for a couple of minutes then strained it through my trusty cloth strainer just as I do for other nut milks. The result was a beautiful white sweet creamer ready for that cup of freshly brewed Apple Crumble Nespresso. 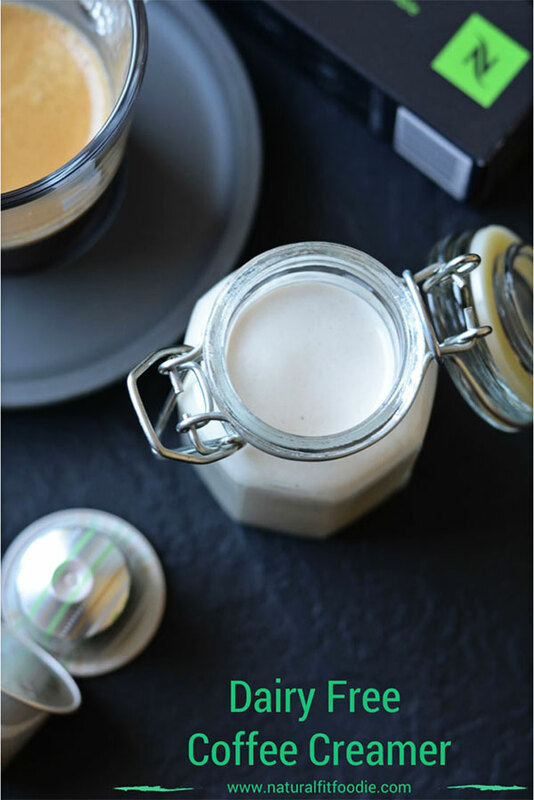 A creamy dairy free coffee creamer for the perfect cup of coffee. Place all ingredients in a blender and process until the nuts and dates are completely broken down. If you pre-soak your dates you can use the soaking liquid in place of water. Strain using a nut milk bag or cheesecloth. Store in the fridge, it will keep for a week. This looks delicious! 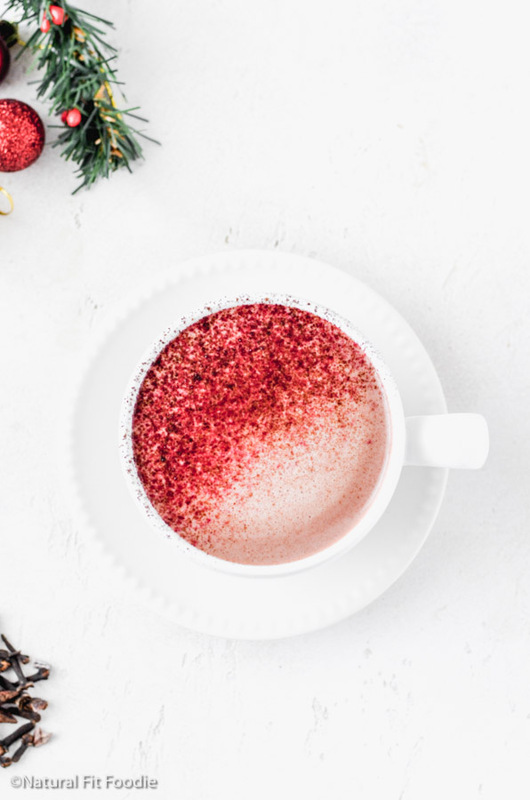 I’m not a coffee drinker but my hubby and mom are and I will definitely make sure they know about this – much better than the regular dairy creamers! Milk looks rich and creamy. When I prepared almond / cashew creamer, it always curdled when added to piping hot coffee or when I pop in microwave , do you have any tips to fix the problem. Hi Sam, I haven’t had any experience with this creamer curdling. Due to the absence of gums it will settle a bit as would any homemade nut milk but a quick stir solves that. I wake up dreaming of my morning green tea or coffee with almond, hemp or another rich nut milk. 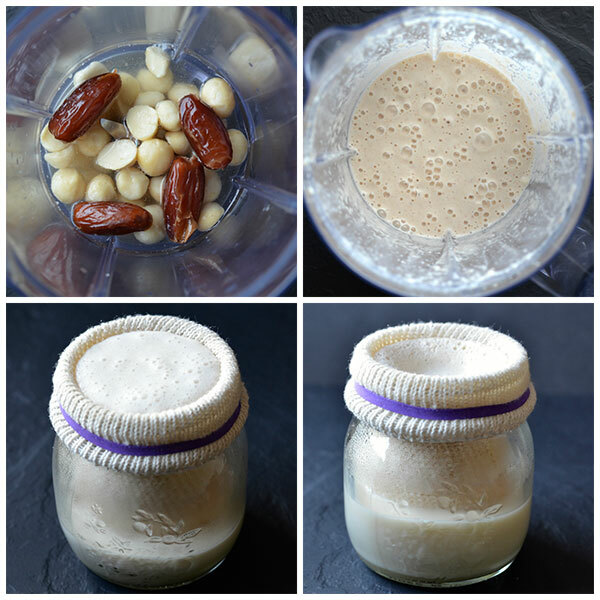 I made a macadamia nut milk recently and it was so delish! I wouldn’t think of drinking my hot beverages without a thick, smooth nondairy milk of some sort, so I love your creamy results! 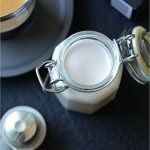 I Thank you for sharing this healthy and delicious Dairy Free Coffee Creamer recipe with us at the Healthy, Happy, Green and Natural Party Blog Hop! I’m pinning and sharing! I usually add a splash of cold almond milk to my coffee, but the macadamia nut + date blend seems so much richer, and so much more delicious! I can’t wait to make this. Thank you for sharing! Where can I find/make the strainer you use to make this? Hi Sarah, I got the strainer at my neighborhood variety store. I live in Spain so might be hard to find exactly the same elsewhere. A nut milk bag , cheesecloth or a cloth strainer work just as well. You can even use a clean stocking if you’re in a pinch ?